This research uses lignocellulosic waste fibers from the fiberboard industry, pulp and paper mills for their effective processing to reduce waste discharge, preserve the ecological environment, and produce innovative and sustainable solutions. The effects of using waste fibers obtained from fiberboard wet process, recycled paper process, and cellulose process as adhesive additives on some physical and mechanical properties and formaldehyde emission of adhesives and plywood panels were examined. 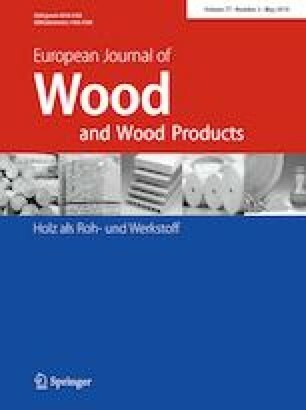 Three major types of fibers, primary fibrous sludge (PFS), primary cellulose sludge (PCS), and deinked paper sludge (DPS) were characterized and evaluated as adhesive fillers in plywood manufacturing. UF adhesive filled with 15 wt% wheat flour (WF) was used as a reference sample. Plywood panels were made of formulations with urea-formaldehyde (UF) resin filled with three different concentrations of fibers, 1 wt%, 3 wt%, and 5 wt%. Compared with DPS and PCS, PFS had a higher lignin and extractives content, and lower pH. These characteristics make PFS a better adhesive filler for plywood than DPS or PCS. Panels with UF/PFS, UF/DPS and UF/PCS formulations at a sludge content of 1–5 wt%, 1 wt% and 3 wt%, respectively had higher wet shear strengths than those made with the control sample. It was also found that the use of fibers obtained from different processes in the UF adhesive composition decreased the formaldehyde emission of panels. The PFS, PCS, and DPS reduced formaldehyde emissions by up to 27.8, 24.9, and 19.4%, respectively compared with control panels, without compromising the shear strength. The shear strength of plywood panels with all investigated sludges met the requirements of the EN 314-2 standard. The authors acknowledge COST Action CA15216 “European Network of Bioadhesion Expertise: Fundamental Knowledge to Inspire Advanced Bonding Technologies” for support of ECOST-STSM-CA15216-010517-088783. Special thanks are extended to M.Sc. I. Salabay for determining the properties of the adhesives. This research was supported by the Slovak Research and Development Agency under the contract no. APVV-14-0506.